Attain the trendy lifestyle you desire with benefits, protection, and privileges. Access a range of benefits that enhance your everyday life by offering a world of convenience so that you can manage financial responsibilities while enjoying life. Free unlimited access to the following regional airport's lounges upon presentation of your card: Dubai, Egypt, Kuwait, Kingdom of Saudi Arabia and Jordan. Travel in peace, with complimentary travel insurance, SAFE TRAVEL - Titanium coverage. 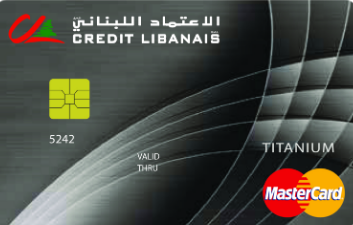 Earn 1 loyalty point for every $10 purchase in Lebanon or abroad on your MasterCard Titanium.